A merchant had a donkey. He used to carry all his goods on the back of the donkey to sell in the market. They need to cross a river on the way to the market. He cared for the donkey very much. The donkey was very lazy and always hesitant of doing work. One day, the merchant had to sell loads of salt. As usual, the donkey and the merchant got down into the river to cross it. The donkey being lazy thought of a trick. It slightly bent it's legs while crossing the river. The salt bags got drenched and dissolved in water. 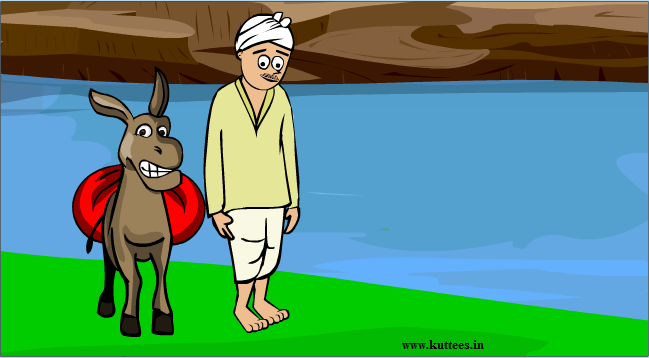 Because of this, the load went down and the donkey became very happy since it need not carry heavy load. As a result of this, the merchant had a great loss of money. The merchant was wise enough to know the donkey's trick. Hence, he wanted to teach the donkey a lesson. The next day, he loaded the donkey with loads of cotton. When the cotton gets wet, it becomes heavy. The donkey without knowing this, played the same trick that day also. The cotton got wet and became very heavy. The donkey suffered a lot carrying this heavy load. MORAL: You can fool a person only few times but not always.